Unsurprisingly, the response to this from the Christian community has been fairly negative. Christian theology just doesn’t teach this. The idea that whenever something bad happens to a person or to a group it is the result of a wicked thing previously done by that person or group is not one that you can find in the work of any major Christian theologian in history, as far as I am aware (I am setting aside for now the obvious fact that in this case the people who suffered and died were not even the same people who allegedly swore this pact – a pact for which there’s really no evidence anyway). For that matter, it is not taught in the Bible either. In fact there are passages in the Bible that directly deny this view. The question that Jesus’ disciples asked suggests that they actually entertained the prejudice against those who suffer that it must be because of some sin that they have committed (or perhaps their parents). This is like what pat Robertson suggested, but Jesus’ very first response to his disciples’ question is to reject this supposition. We should not assume that if a person is suffering then it must be because of some evil thing that they have done. Because the idea that tragedy must be the result of the wickedness of the victims simply isn’t a Christian idea, Christians have rightly taken issue with Robertson’s comments. To be fair, he said these things in the wider context of an appeal to help those in Haiti so it’s not like he was gloating over them or anything, but there was some bad theology expressed nonetheless. You nice, middle-of-the-road theologians and clergymen, be-frocked and bleating in your pulpits, you disclaim Pat Robertson’s suggestion that the Haitians are paying for a pact with the devil. But you worship a god-man who – as you tell your congregations even if you don’t believe it yourself – ‘cast out devils’. You even believe (or you don’t disabuse your flock when they believe) that Jesus cured a madman by causing the ‘devils’ in him to fly into a herd of pigs and stampede them over a cliff. Charming story, well calculated to uplift and inspire the Sunday School and the Infant Bible Class. Pat Robertson may spout evil nonsense, but he is a mere amateur at that game. Just read your own Bible. Pat Robertson is true to it. But you? Educated apologist, how dare you weep Christian tears, when your entire theology is one long celebration of suffering: suffering as payback for ‘sin’ – or suffering as ‘atonement’ for it? You may weep for Haiti where Pat Robertson does not, but at least, in his hick, sub-Palinesque ignorance, he holds up an honest mirror to the ugliness of Christian theology. You are nothing but a whited sepulchre. Most of this is obviously just rhetorical fluff and filler, squeezing in as much false outrage and colourful language as possible. There is also a healthy dose of simple falsehood. Now of course there is no shortage of people willing to tell lies about people they don’t like, but surely Dawkins must have some sense that as someone to whom at least some people in the public listen when it comes to religion (although I honestly don’t know why), he has a responsibility to rise above the cheap task of “lie and hope they dont’t know any better.” Unfortunately he has not done so, and just barges through his rant with no concern for fact. He claims of Robertson, for example, “he is the Christian who stands squarely in the Christian tradition.” What tradition? How many theologians does Dawkins cite to establish this claim about “the Christian tradition”? Exactly zero. In the Bible there are some (two that Dawkins lists) cases where God acts in history to punish people for their sins. Therefore as Christians who accept the teaching of the Bible, we must think that anytime a tragedy happens, it is a case of God punishing people for their sins (or the sins of their forbears or countrymen etc). Dawkins knows a lot about zoology. But why does he have to act like he’s a brilliant theologian or philosopher of religion all the time? It is painfully obvious where this rubbish is wrong, and yet simply because he has scientific credentials and because he says just what a group of people want to hear, his logical misdeeds are overlooked. I frankly fail to see the difference between this sort of fundamentalist silliness and cases of people with degrees in engineering or education thinking that they have a mastery of science and should be regarded as experts on evolution and creation – precisely the sort of thing that Dawkins himself would take issue with. What’s amazing is that even some people who actually know better because they have a theological education behind them – are willing to give Dawkins’ claims here the thumbs up. It’s not coincidence, I’m sure, that the person who does this (John Loftus) also holds Dawkins’ prejudices against Christianity. The message that Dawkins (and Loftus) is sending is very simple: If Christianity is the target, then it doesn’t matter how stupid my arguments are, because the cause is a just one. Actually that would sum up just about every secular arguments against Christianity. Can you exposit on Romans 8:22 and get back to me on your assertion. The most theological book in the Christian Canon argues against your position. Or don’t they teach the bible at your mega-church? Chuck, can you please explain what you are talking about? What is the form of the argument that you are vaguely alluding to? If you think that you can marshall an argument using Romans 8:22, I certainly won’t do it for you. Let’s hear it! And lastly, since when did a church with no more than a couple of hundred members qualify as a megachurch? If you’re going to make a point, just come right out and make it. Personally, I don’t rule out that God judges nations with disasters, etc (since there is biblical precedent). However, whether or not any disaster was a judgment from God is not our call to make. Overall, I think the wisest course of action to take is found in Luke 13:1-5. This is a fine post, and Robertson is the type of man who would bless us greatly if he simply got off the air. That said, I think the passage in Luke 13:1-5 is usually read, as Douglas Wilson says, 180 degrees from its actual meaning. Jesus is here saying that the Galileans died because they WERE wicked, and pointing out that the rest of the Galileans are just as bed, and must repent lest they likewise perish. The Galileans whom Pilate killed were likely proto-Zealot revolutionaries. This is another of Jesus’s warnings against taking the sword up against Rome (just like Luke 23:30). Just a caveat. In terms of modern application, if Robertson wants to suggest that the Haitians were being punished for something, he should ask himself if America does not serve such a punishment tenfold. Dave, Jesus stresses what was not a reason for the deaths of those people. Did they die because they were more wicked than you? No. To take this as a way of causally linking their deaths with their wickedness would be, I think, to apply it in a way 180 degrees from how it was intended. Dawkins loves (trying) to bring out the worst in people, it must be frustrating for him that most Christians are reasonable, kind, and normal people. Glenn, are you purposely being ignorant here? My claim is that defending the Christian faith makes a person ignorant. John Calvin? Reformed theologians? Come on now. Become informed. Luke chapter 13 verses 1-5 merely has Jesus saying that everyone deserves what happens to them, it’s just some people don’t get what they deserve. Does your God do this or is Isaiah mistaken? I find you to be dishonest with the facts or ignorant, or both. At best a fair exposition of the history of Christian theology and the Bible would produce a mixed bag because theology and the Bible is a mixed bag of ideas. John, you are not making any substantiated claims. My point was that Christian theology does not teach that if a bad thing happens to someone, it must be because of a bad thing that person (or group) has done. Don’t hide behind sweeping claims John. Show that it is a reformed view that if a person or group suffers, it must be because of some bad thing they have done. I am informed. Are you? Let’s see it. While you’re at it, maybe you could tell us what wicked thing Calvin believed that he was being punished for when he suffered some major ill health. A pact with the devil perhaps? No, actually it has Jesus saying that a group had something bad happen to them when it wasn’t because they particularly deserved it. he makes no somment at all on everyone deserving bad things to happen in history to them. And now you say that I am dishonest? I find this a bit rich, John. The facts of history are against Dawkins. Logic is against Dawkins. Scripture is against Dawkins. And now you throw your lot in with him? As for your quotation of Isaiah, you’re getting distinct issues muddled up. Yes of course that passage teaches that God has all things under his control, and your angle there is the problem of suffering. But that is not the issue that I am taking you and Dawkins to task over. Dawkins seems to think that Christians ought to agree with pat Robertson over the earthquake, saying that it is the result of some wicked thing done by Haitians. That’s not the same issue as why God allows or causes bad things to happen, John. Are you really sure it’s me being dishonest? Dawkins’ comments were a logical catastrophe. Endorse them if you like. Feel free to substantiate your claim about Reformed theology any time (namely: that it teaches that if a person or group has a bad thing happen to them, it must be because of some wicked thing they have done). As you’re an honest person who would never bluff, I’m sure you won’t disappoint. At the minimum Reformed theology says a whole group of people, the human race, suffered for the sins of Adam even though they never sinned themselves. But only if some of us would not have sinned under the same initial conditions can the test in the Garden be considered a fair one. And if some of us would not have sinned then people are being punished for something they never would have done. And being a former Arminian myself they hold that our own sins punish us. We don’t always get punished for what we do but when we experience punishment it’s because of our sins. You know, I really find you to be disingenuous. You say whatever it takes to defend your faith, even claiming that others who believe differently than you do are ignorant, as if they must be on the par of a poached egg or something. Sheesh. Do you not understand the history of Christian theology? Are you that pompous to presume to tell us all what any moron should have understood at any time in the past? Admit that Christian theology and the Bible is a mixed bag of ideas like others do and you’ll gain some respect from me. Or study it for yourself. I’m not going to waste my time with someone as ignorant as you are by typing in what you can read for yourself by comparing Systematic Theological books to each other along with Encyclopedias and Dictionaries. John, you are shifting the goalposts in an obvious way. The issue raised by Pat Robertson’s comments as well as Dawkins’ comments was not the more general issue of original sin and the fallen state of humanity. The issue was whether or not a Christian is committed to agreeing with Robertson and whether Christians ought to think that when a person or group suffers some calamity – any calamity – it must be because of some wicked thing they had done in the past. You claimed that I was dishonest or ignorant to deny this, and you suggested that if I were properly informed of Reformed theology I would know this. But now when pressed to back this claim up, you do a bait and switch and now appeal to the Reformed belief that humanity is condemned on account of original sin! And you said I’m being dishonest? What is at stake for you John? Where is the harm in just admitting that Dawkins said something really stupid, and you were a bit too zealous in your crusade against Christianity so you didn’t think more carefully before agreeing with him? Why not just explain why you agree with Dawkins in saying that all Christians ought to agree with what Pat Robertson said about Haiti? As for the “read it yourself” comment, John – are you really going to be that childish? I do have an online CV you know. 15 So the LORD sent a plague on Israel from that morning until the end of the time designated, and seventy thousand of the people from Dan to Beersheba died. 16 When the angel stretched out his hand to destroy Jerusalem, the LORD was grieved because of the calamity and said to the angel who was afflicting the people, “Enough! Withdraw your hand.” The angel of the LORD was then at the threshing floor of Araunah the Jebusite. How many theologians did you cite to establish your own claims about Christian theology, Glenn? 1. In the Bible there are some cases where God acts in history to punish people for their sins. 2. Therefore as Christians who accept the teaching of the Bible, we must think that anytime a tragedy happens, it is a case of God punishing people for their sins (or the sins of their forbears or countrymen etc). Why would you ever want to be seen in public defending crazy reasoning like this? John? It’s a bit like saying that since some poor people are lazy, all poor people must be lazy. You wouldn’t endorse that kind of silly reasoning, yet when Christians are the target you just close your eyes and repeat Dawkins. Why? Besides, it is very hard to offer quotes that aren’t there. The claim that those who suffer must be suffering because they have done something evil in the past is a missing claim. It aint there. What exactly would I be citing? Dr Bob, illegimately shifting the burden of proof is naughty. The accuser in court must make his case, or it gets thrown out. Dawkins made a claim and never backed it up. I have called it as I saw it. His case is thrown out. Glenn, you are defending the indefensible here, trying to dress it up with logic. In the Bible sin is the only reason given why people suffer except in two special cases, Job and John 9:1-3. So therefore as Christians who accept the Bible it seems reasonable to suppose that when disasters happen, except in special cases, they are sent by God to punish people. That’s what many believers have accepted down through the centuries. My claim is that you are either ignorant of this history or dishonest about it. Robertson stands squarely in that tradition. I discussed this in my book right around page 246. Have you read Bart Ehrman’s book, “God’s Problem”? OK John, so you won’t actually defend Dawkins, you’ll just offer assertions about how right he is. Fair enough. Join the story tellers. But do not ask to be taken seriously. And in Job God is still in charge of what happened to him so there’s no escaping the fact that God sent those disasters upon him. John 9:1-3 uses the Greek subjunctive mood which means that “the purpose” of the man born blind was that God would be glorified. That’s “purpose.” God did this to him for a purpose. So in every single case in the Bible the reason why people suffer is because the man in the sky brought those disasters upon them, whether for sin, testing or to glorify himself. Glenn, Robertson and other Christians are not in a priveledged position to know in advance, given the Hatians so-called pact with the Devil, that this was an exception. He can reasonably conclude God sent the disaster upon them because of their sins, you see. And therefore Dawkins can conclude, given Robertson’s reasoning from theology and the Bible, that given his assumptions he’s a more consistent Christian than you are. And I do agree with Dawkins on this point. It is YOU I cannot take serioulsy. In my opinion, this is just one more case of the Bible presenting contradictory views. According to the Scriptures, Sodom and Gomorrah were punished because of their specific sins. The Canaanites were to be utterly destroyed because they were incorrigible. On the other hand, the Scriptures also teach that hardship or suffering is not always related to specific sins committed by the sufferer as you have pointed out. So, it seems to me that the only way to harmonize these two points is to say that sometimes the suffering is directly related to the specific sins of those suffering and sometimes its not. So on that basis, Robertson could be right. Well, the best interpretation of anything is the contradictory one. Ken, you agree that the Bible teaches that some specific people were punished for their sins, and that it also teaches that not everyone who suffers is being punished for some specific sin. That’s fine and I agree with this assessment. What I don’t understand is why you think this is a contradiction. John, your reference to the blind man is no good here. The issue is whether we should attribute people’s suffering to some sin they have committed. That blind man is not such an example. As for your comment about an “exception,” you are clearly begging the question by assuming that for Christians, the norm is that we should think that anyone who is suffering is suffering because of some wicked thing they did. Yet whether or not this is true is the very thing in dispute. Neither Dawkins nor you is able to substantiate this claim, and yet you keep saying that I shouldn’t be taken seriously. I know. Silly me. How dare I think that claims should be substantiated. The silly flailing of Richard Dawkins aside, HERE is a better representation of a Christian response to Pat Robertson’s unChristian comments. The reason for Haiti’s poverty is not their mythical pact with the devil but rather some unscrupulous lending by other nations. Whether or not some tragedy is a punishment or not, I think the question is whether it makes sense in the narrative of the people’s lives or not. Senseless things happen because the world is broken until it will be redeamed. But God does use the brokenness of the world against peoples sins. The haitian tragedy does make some sense if the legend with the pact with the devil is true and to this day, they are steeped in voodoo. Another matter to consider is the issue of corporate vs. individual responsibility. This is something that we don’t really have much use for in the west, but it is very much a biblical concept that a people as a whole is responsible for terrible things that happen even though there are innocent individuals who suffer. The individuals aren’t individually guilty, but they are part of the society which recieves the punishement and they share in the corporate responsibility. This is not a bad thing, not for Christians who would follow Christ’s example in sharing our burdens with us. Finally, with the scriptural considerations, there is the matter of the old covenant with the new. In the old covenant, there is a closer tie with the nation’s fate and the tragedies and blessings it recieved. In the new covenant, we do see some repudiation of that (but not completely). John, do you ever not plug your book? Go ahead and tell everyone the laundry list of people that have read it and claimed it was the best…. I wish Robertson would stop talking. 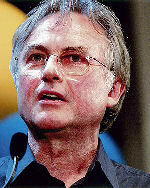 I wish Dawkins would stop talking too. that’s kind of what I was implying, Glenn. I find Dawkins, Hitchens, et al simply hard to understand. I can’t imagine being so passionately committed to being “not” some other position. Glenn i feel your argument is only a appeal to Reformed theology. Robertson and Dawkins could still be correct. Ali G, can you point out where I appealed to Reformed theology?